My goal: raise three daughters who love spending time in the outdoors. 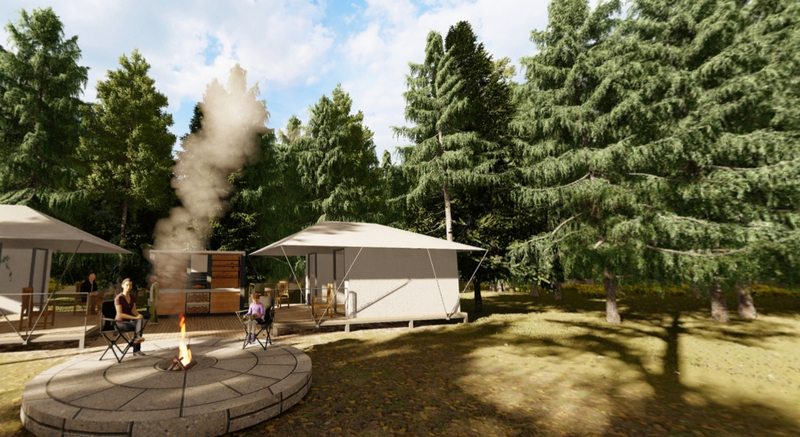 Currently ages 3, 6, and 9, this means staying in mostly front-country campgrounds, bringing just the right gear to keep it all safe, comfortable, and fun. Hopefully, I’m priming them for future backcountry trips into some of the 42 designated wilderness areas in Colorado, but first things first. 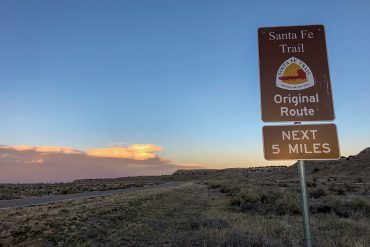 This past summer, I took my family on a 1200-mile, 30-day, car-camping, hot-springs expedition through the western part of the state. 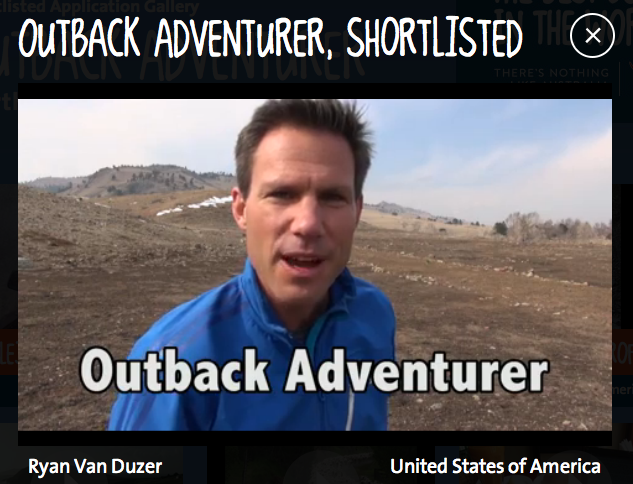 Along the way, I field-tested some awesome gear, some of which I wrote about last June in my “Burly Dad’s Ultimate Camping Gear Guide Part 1.” But there were a few overflow items that didn’t make it into that first article, and which deserve some mention. Bonus: Part 2 is not all about camping. I travel to Central America a few times a year, usually to Nicaragua (to assist camera crews with their TV productions). 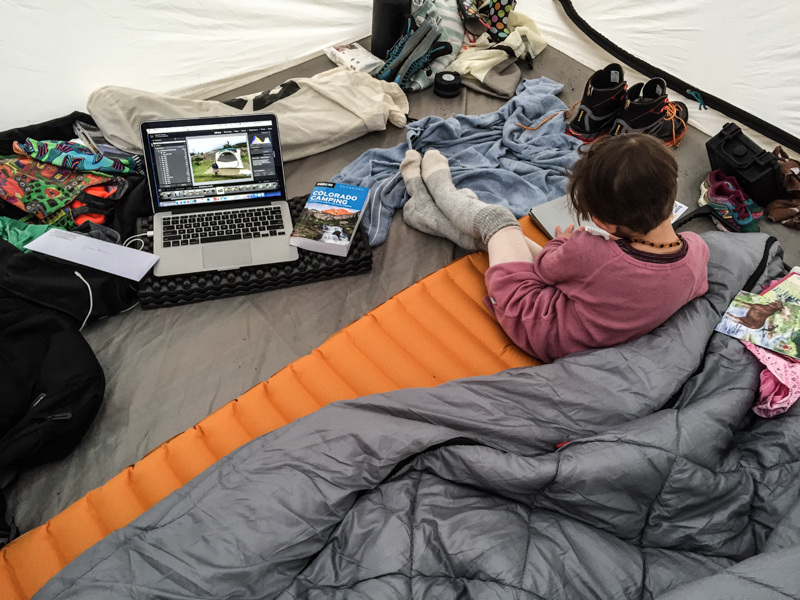 So for me, the optimal piece of gear is equally practical in a Rocky Mountain campground (starting fires and chasing toddlers around), as it is in the tropics (slogging cameras and tripods up active volcanos). Camping with children is not necessarily relaxing. In fact it’s downright exhausting. But every now and then, there is that moment, no matter how short that makes it all worth it. Sometimes, that moment is helped along by the right equipment. 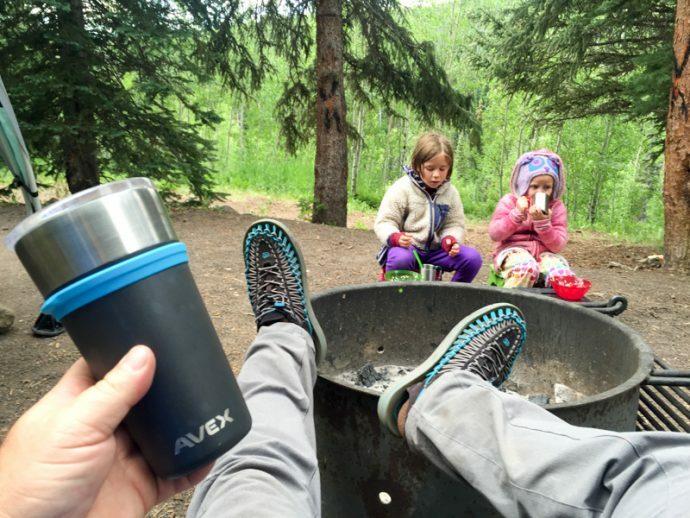 Pictured above: the vacuum-insulated stainless steel AVEX Pint Glass ($24.99) keeps coffee hot all morning and beer cold all evening. In this photo, the girls are eating breakfast and I can actually kick back in an REI Camp Stowaway Low Chair ($45), which is compact and sturdy, and as it promises, sits nice and low (handy at both the campfire and at bluegrass festivals when you don’t want to block anyone behind you). For footwear, my Keen UNEEKs sandals have barely left my feet the last two summers of road trips. Don’t worry, I wash them by frequently walking into rushing snow-melt creeks or soaking them (and me) in a Rocky Mountain hot springs. These shoes were equally ideal for busting around the campsite, crashing into a lake, or just driving to the next adventure. They are made from stretchy cord material that hugs your entire foot, but feels like it’s not there. This year, they have a new style, the UNEEK 02, which weigh less, has a more protected heel, and several styles of cord. They’re weird-looking and get a lot of comments, and they’re nice for the streets of Managua as well, where they look formal than tattered Berks. 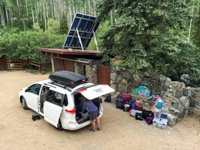 While driving around the state’s campgrounds last year, updating my Moon: Colorado Camping guidebook ($19.99), I lugged my laptop through some dusty, rainy, and rocky environments in order to type up each day’s notes. I didn’t do much to protect my screen and keyboard, but I always snap a Speck laptop case ($49.95) on the outside, mainly to prevent overheating, but also to cushion the inevitable drops. The best way for clothing to span both camping and tropical travel is for it to be quick-drying, light, and strong. The burliest expedition pants I’ve seen lately are the Fjällräven Abisko Lite Trekking Trousers ($150), a lightweight, slightly stretchy, breathable pant that stays drafty, even in the Central America rainy season. Just enough pockets, loops, and zippers, but not too many. The lululemon ABC Pant ($128) with its self-proclaimed “Anti-Ball Crushing technology,” are pretty nice on the airplane, and they look just formal enough to command a little extra respect than ripped jeans or shorts. Coming in December from lululemon, the Metal Vent Tech Short Sleeve shirt ($88), a technical travel tee with “anti-stink silver” woven into the wool and strategic venting. 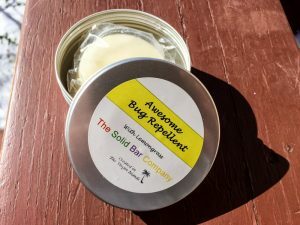 To avoid mosquitoes, I’ve always preferred covering up with socks, long pants, and long sleeves to slathering myself with bug dope. That usually meant lightweight Nylon travel clothes for an physical barrier against possibly infected probosci. Lately—especially since the rise of Zika—there are a growing number of lines of treated insect-repelling material. 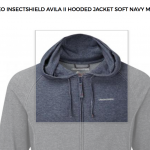 I checked out a few items from Craghoppers Travel and Adventure Apparel National Geographic line, all treated with something called NosiLife InsectShield. The hoodie I tried was pretty effective at the few campsites that had mosquitoes at night and morning. The shirt and pants worked well in Managua—I liked the hidden zipped security pockets and UPF40+ protection on the collar. They also make pants, shorts, and travel hats. For more tops, I’m a big fan of the natural-fiber Merino wool revolution which seems to be going on. 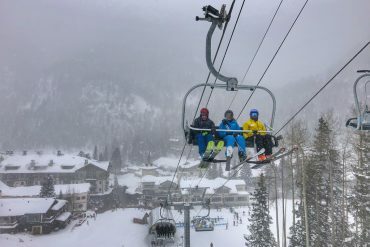 VOORMI is a Pagosa Springs, Colorado–based wool apparel company which makes weather-adaptable jackets, shirts, and long johns. 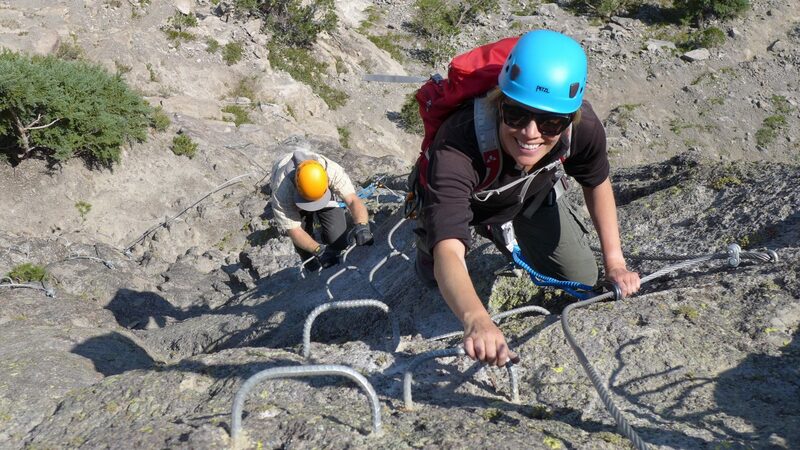 Their gear is designed for backcountry hiking and hunting trips, which they test out in the San Juan Mountains. 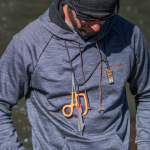 They use wool sourced in the Rocky Mountains, but also strategically weave in technical materials like moisture-wicking fibers on the inside and abrasion-resistant fibers on outer surfaces. I liked their Eleven.9 hoodie ($149); it kept me warm in the morning, then continued to breathe as the sun heated things up. It was water repellant in light drizzles while setting up camp, which was nice too. On my next trip to Nicaragua (to film at coffee farms in the northern highlands of the country), I’m trying out some “Underneathwear” from EROIX, which they describe as “dual-use shorts that allow you to be suited at all times.” Sounds useful if I forget my bathing suit but really want to swim some laps at the hotel pool or a dip in some high-mountain misty lagoon in coffee country. 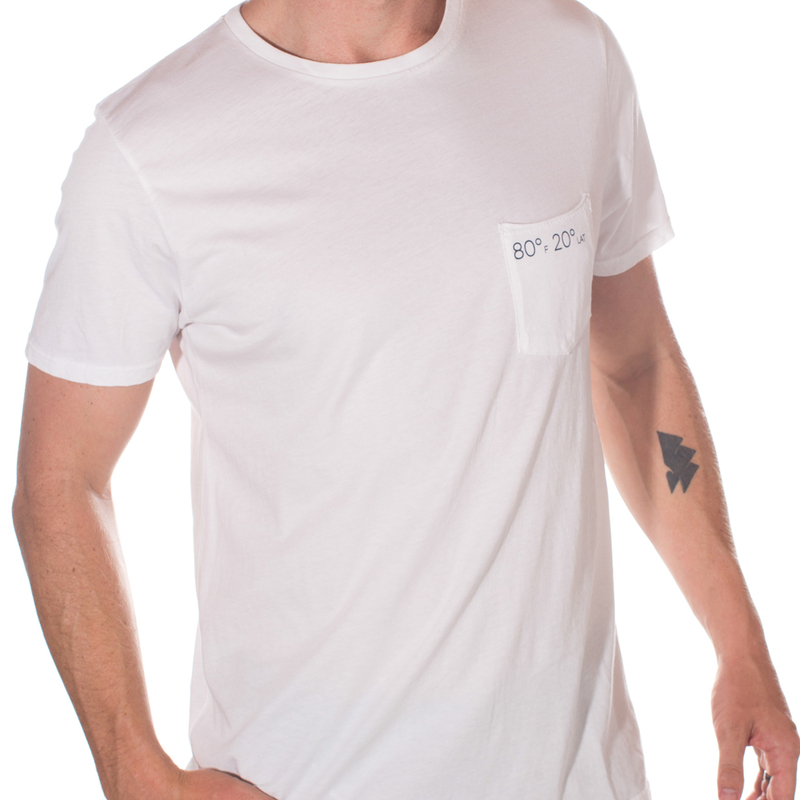 EROIX also make “latitude specific tee shirts” made in the USA with 100% organic, lightweight, ring-spun cotton ($38–42). 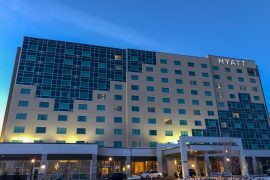 When I told them where I travel, they recommended an “80/20 for Nicaragua and a 60/40 for the Rockies”—those numbers are Fahrenheit temperature/ degrees latitude. Original Grain plants 10 trees for every watch sold. I rarely wear a watch, but when I do, it is made of sustainably sourced exotic hardwood and does nothing except tell the time. 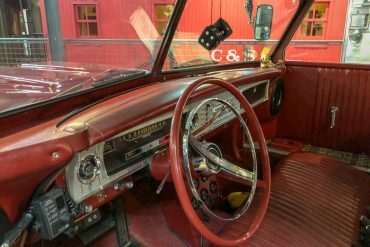 No email, no FitBit, no bells, nor whistles. Just hours, minutes, and a mellow, natural look. 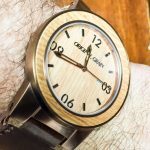 Original Grain Watch Company makes timepieces from FSC-Certified hardwoods from Argentina, Africa, Indonesia, and the US. I’ve also never seen this before: for every watch sold, they plant 10 trees in Sub Saharan Africa, with the goal of 1 million trees for 2016. The planting focuses on forest garden programs in Cameroon, Kenya, Senegal, Uganda and Tanzania. For the fancier man in your life, they have a Gentleman’s Kit which includes Jim Beam Black whiskey, a flask, and a limited-edition watch made from reclaimed oak from Jim Beam Barrels. It comes in a classy gift box (only 500 units are being made, $499). Back in the day, I shopped for my travel bags at thrift stores, looking for the sturdiest, most beat-up backpacks and duffels I could find. Then I’d slap a bunch of duct tape on them to make them look even grungier. I thought this would deter thieves, especially when my gear was being tossed into the back of Nicaraguan public buses and pickup trucks. I still think this is a good idea, especially for you young longterm road warriors. These days however, my trips are more focused and beg for updated gear, so I’ve stepped things up a notch. 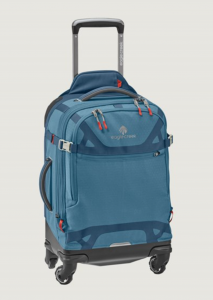 I’m currently trying an Eagle Creek Gear Warrior Carry On ($269), which I used on both my car camping trip and my Nicaragua schlepp. She isn’t the sexiest or even burliest-looking bag on the lot, but like I said, I like that non-flashy look. This bag has 4-wheel-drive and handled all the drastic transitions, bumps, and bruises exceptionally well. In fact, after a full summer of abuse, my Gear Warrior still looks brand new. I will continue testing and report back after a few thousand more miles. 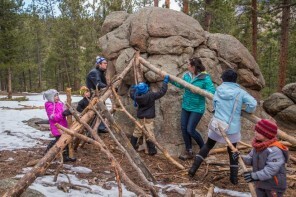 Sometimes, camping is a time for splurging on sugary, s’morey treats, but most of the time, being on the road with kids, cooking at campgrounds, we try to keep it healthy. 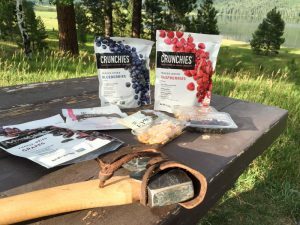 For car-snacking and morning oatmeal garnish, we liked the freeze-dried fruits & veggies by Crunchies ($4.99 bag). Another option, Graze ($11.99 for 8 snack packs) offers individually wrapped, single-serving-sized snack mixes with over 100 flavors, including “honeycomb flapjack,” “herby bread basket,” “banana caramel dippers,” and “super kale and edamame.” The individual packaging isn’t ideal for reducing waste, but they were handy when snacking on the trail or in the car and the kids liked opening their own little packs. 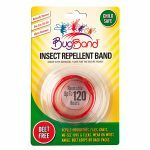 To keep the bugs off my children, I outfitted each daughter with a DEET-free BugBand bug repellant bracelet and spritzed their necks and ankles with BugBand Pump Spray Lotion. Made from Geraniol vapors, the bands are made to repel blood-sucking insects, ticks, mosquitoes, and no-see-ums. They seemed to work pretty well for us and the smell was not overpowering, as I thought it might be. Lemongrass, DEET-free bug repellent from The Solid Bar CompanyI also liked this bug repellent in solid bar form (pictured right), made from castor oil, lemon eucalyptus, yarrow, and shea butter “which re-hyrdrates the skin and has a low SPF.” Like all natural bug repellants, I found I had to keep re-applying, at least every hour or so at the buggier campgrounds. At dusk, it could get pretty bad. 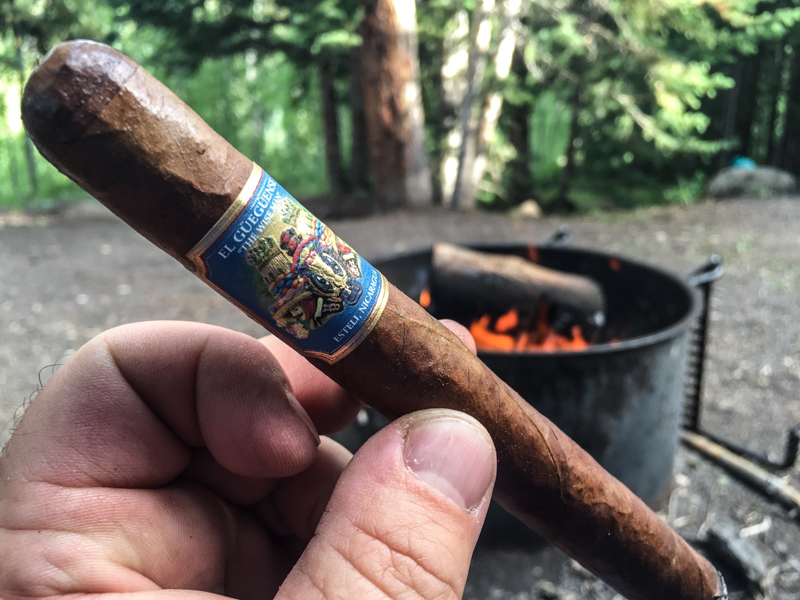 That’s when I called in the rest of my resources for keeping mosquitoes out of my camp kitchen: I lit up an insect-repelling Aromaflage 40-hour candle ($40) and, for good measure, a Nicaraguan El Güegüense cigar from Foundation Cigar Company. You can never be too safe. There are many natural mosquito repellants on the market, including fresh Nicaraguan cigars. Disclosure: The blogger received product samples from some of the companies above for review purposes. He was not paid by any company that was mentioned in this article. Opinions are all his own.